Paul McCartney is one of the most popular people on the planet, consequence of being a member of what is arguably the most popular band in human history, The Beatles. Since the disbandment of the group, he has gone on to have an extremely successful solo career. Without a doubt, he is a famous name, but one person who isn’t as famous as he is, certainly to the millions of music fans all over the world is Nancy Shevell, his third wife. She has been in a marital relationship with the legendary Rockstar since 2011 after dating him for four years. Learn more about her and how she came to be associated with the famous singer. It is not strange or unheard of to have a spouse whose glory and limelight overshadows you, especially when that spouse is one of the greatest performers to ever live. However, it doesn’t negate your own successes, especially when you are Nancy Shevell, the Vice-President of a business conglomerate. Nancy was born on the 20th of November 1959 to parents, Myron and Arlene Shevell in New York but was raised in Edison, New Jersey. She came into an affluent family as her father was the owner of the transportation company, New England Motor Freight. A very determined Nancy would later run her father’s transportation business, a fact that comes as no surprise due to the fact that as a child, she was often more interested in toy trucks, choosing to play with them as part of her tomboy persona instead of the girly dolls that most girls were known for. She would spend more time at her father’s truck terminals, playing around with co-workers. As a young girl, other activities she enjoyed included skiing and flying. She also represented her high school in the all-girl football team. For her education, Nancy Shevell naturally followed up her childhood interest to the college level, majoring in transportation at Arizona State University where she continued her track record of finding more comfort in male-dominated spaces. Upon graduation, she joined her father’s business in 1983, faced with the arduous task of returning the business to its glory days after a string of bad years which had been a result of her father’s bad partnership with his brother and accusations of fraud. Despite a massive reluctance to continue with the business as the stress of her father’s mess piled on, she persevered and would later become the Vice-President of Shevell Group of Companies, which comprised of several companies, including the New England Motor Freight. In 2001, as a reward and in recognition of her work as Vice-President, she was named onto the board of The Metropolitan Transportation Authority by George Pataki, who was the governor of New York at the time. However, it is not all typically male interests for Nancy. She is also known to frequently enjoy fashion shows, which she regularly attends with her husband, Paul McCartney. For someone who has worked as hard as Nancy Shevell has running many shows in male-dominated spaces, turns out that those years of playing with toy trucks instead of dolls bore their own fruits. Life as the Vice-President of a company she helped transform into a success story has helped Nancy Shevell to a sizeable net worth of $200 million. 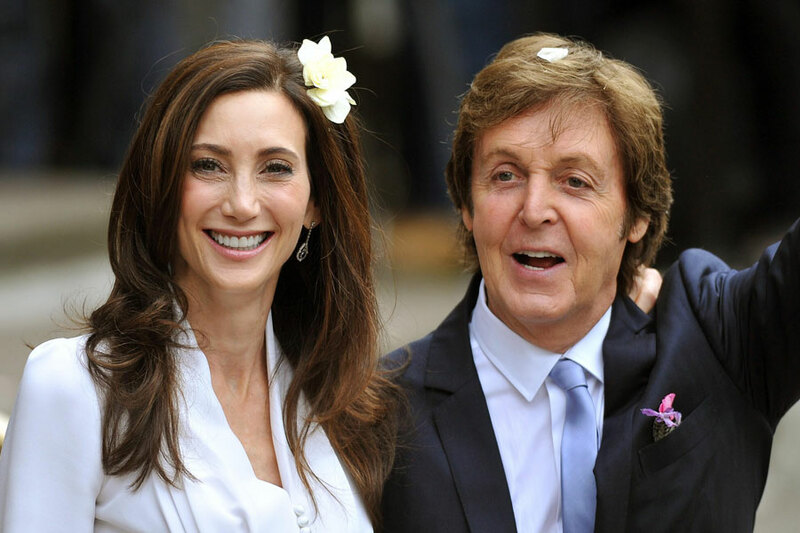 Nancy is currently married to Paul McCartney, whom she met while she was in the process of getting separated from her first husband, Bruce Blakeman who was a politician. She had met Blakeman in her university years and had gotten married to him after a few years of dating. The marriage produced a son, Arlen Blakeman, but their marriage finally came to an end in 2008, and shortly after, she and Paul announced their relationship to the world. It was revealed that both parties had met in the Hamptons while they were both still married and maintained communication until Nancy was out of her marriage. Since the relationship went public, the couple has maintained a private and happy image to the adoring public who have been a big fan of their relationship which produced one of the most expensive engagement rings in history, a $650,000 1925 Cartier. Nancy and Paul got married in London. Both parties have children from their previous marriages and they have both incorporated them into their new family. As for her extended family, Nancy lost her mother to breast cancer in 1991 and is herself a survivor. Nancy Shevell is blessed in all dimensions and she is not one to hide her gorgeous body in any way, she has been known to enjoy holidays and beautiful weather at the beach and to put her bikini body is full display. She stands at a decent 5 feet 10 inches and weighs 60kg. She also spots a figure that measures 29 inches for bust, 27 inches for waist and 34 inches for hips. To crown it all, she has a mane of hair that is brown in color matching her eyes.